I doubt any of you guys will be surprised to find out that while I used up stuff this month, I added even more to my list. In my defense I only voluntarily added a small amount of products: the rest were totally not my fault. Up first, the products I used. I liked the cleanser, moisturizer and serum from Riversol: they left my skin soft and clean and didn’t have a heavy perfume smell. If they weren’t so ridiculously expensive, I’d consider using them again. Next up was something more in my budget: the Eucerin lotion which lived up to it’s promise of being good for extremely dry skin and fragrance free. The Arbonne foot cream was effective, but buying a full size would involve interacting with home sales ladies and is way more than I’d spend on lotion. Finally, I love love love the Cud-Zu Goat Farm soap. I used to buy this stuff when I lived in North Carolina and right now I have my fingers crossed that my mother will stick another bar in my Christmas stocking next month. Now, I confess that I willingly signed up for the Target Beauty Bag and I solemnly swear that I will use up these products soon! Then I pet sat for a friend for free one weekend so she could go to a fancy benefit with her mother. Her mother went a little crazy on the silent auction and insisted on sending a gift basket to share with me. Among a variety of pampering products, there were a number of things that definitely count as products and they’re full sized. Oops! At least my addiction leaves me clean and fresh smelling? Anyways, for the entire (and newly expanded) “I Complete You” Product Challenge list, check it out on its own page! What did I think about the products I used up? I wasn’t the hugest fan of the Garnier Fructis Sleek & Shine shampoo, which left my hair greasier than usual and really flat. As for the Shiseido skincare line, I loved how soft the products made my skin feel, but they were a bit too perfume-y for my taste. The Peter Thomas Roth soap was nice, as was the Painted Earth moisturizer. I did like the Arm & Hammer Sensitive toothpaste, which I might have to check out when I run out of my current tube. 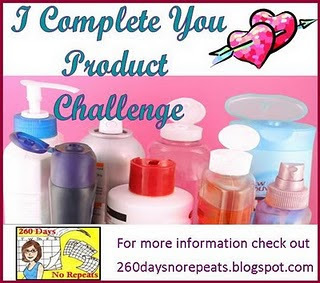 For the entire “I Complete You” Product Challenge list, check it out on its own page! Apparently, July was the month for finishing moisturizers and lotions: the dry heat must bet getting to me. Also, the Kiss My Face foot scrub? Heavenly. I think I might have to buy some for real. Pedicures at home due save money, after all.